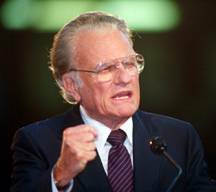 “Some people are born Christians,” at least so says renouned Southern Baptist evangelist Billy Graham. Now that mainstream evangelicalism has fully embraced the sinfully ecumenical Emergent Church, with its new postmodern form of “big tent” Progressive Christianity—a Liberalism 2.0—sometimes referred to by the Emerging Church as Emergence Christianity, it’s become fashionable to blame online apologetics and discernment works like Apprising Ministries for hindering the spread of the Christian faith. I would offer that it’s because of faulty philosophy like this; and I say philosophy because that most certainly is not theology. The problem is: If some so-called “religious” people are simply born Christian without being “born-again” we have just negated the doctrine of regeneration; we have salvation by osmosis ala the heresy of the wider mercy view, which Graham espouses in the video below. However, God’s Word tells us that someone who has not been regenerated remains a slave of sin (cf. Romans 6:16-20); and no matter how religious one might be — Whoever believes in the Son has eternal life; whoever does not obey the Son shall not see life, but the wrath of God remains on him (John 3:36). So while we are God’s offspring in the sense of being His creations, the non-Christian is still by nature children of wrath, like the rest of mankind (Ephesians 2:3). The Bible unambiguously states that all who receive Jesus, who believed in his name, he gave the right to become children of God (John 1:12); that’s pretty hard to do before you’re born, and simple logic tells you that if you need to become something, then you were not that thing before. Salvation is by God’s grace alone, through faith alone, in the finished work of Christ on the Cross alone. As a former Roman Catholic, Graham’s view kind of reminds me of the false gospel of Roman Catholicism where babies are baptized and thought to be born again; belief by proxy before one is capable of even being cognizant of Who Jesus is. Graham himself has long been sinfully ecumenical; and as I showed you in Billy Graham’s Apostasy Is Older Than You Think and Roman Catholicism; Billy Graham, “We Are Brothers”, despite the fact it has anathematized the Gospel of Jesus Christ itself, Billy Graham has been in bed with the apostate Roman Catholic Church for decades. I’m also aware that, if it’s supposedly good, anything goes in this Laodicean age of timid tolerance within increasingly squishy evanjellyfish; and as such, we’re so conditioned to bend over backward to try and cast doubt upon whatever people say. 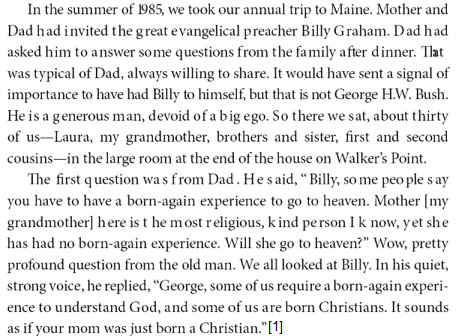 My point being, there are those who would say that, for whatever reason, maybe Billy Graham was misquoted by George W. Bush. In closing this, for now, I offer that the following the other day from Christian Post gives us more reason to believe Bush’s recollection is correct. The Rev. Billy Graham made a rare appearance Monday at a book-signing for former President George W. Bush and his wife, Laura Bush. The 92-year-old evangelist, who sat in a wheelchair, and his son, Franklin, had lunch and prayer with Bush and the former first lady before heading to the Billy Graham Library to receive signed copies of the Bushes’ books and pose for photos. Friends for thirty years; more than enough time for friends to discuss what they believe about salvation. George W. Bush, Decision Points [New York: Crown Publishers, 2010], 31.